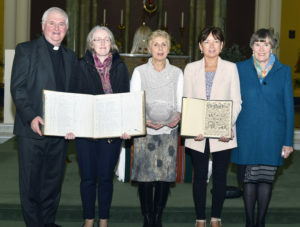 Bishop Michael Smith, the retired bishop of Meath, paid tribute to the “immense giving” of so many Columbans over the Society’s 100 years of mission. 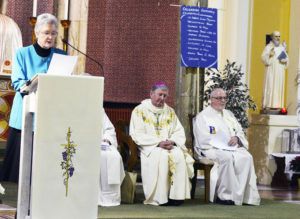 In his homily on St Columban’s Day in Dalgan Park, Bishop Smith said the Missionary Society of St Columban had an “extraordinary story” which had evolved over 100 years as so many had sought to ‘go out and preach the Gospel to all people’. Referring to the title of Fr Neil Collins’ history of the Columbans – ‘A Mad Thing to Do’ – he said it was a mad thing to do in the context of the time, when Europe was ravaged by war and he lamented the “savagery” of World War I. 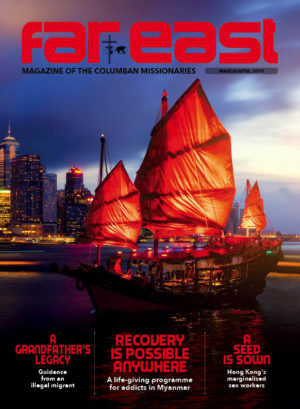 The first Columbans had headed off to China on the other side of the world and encountered a very deep culture and a very difficult language. He gave credit to Bishop Galvin’s and Fr Blowick’s courage and example. 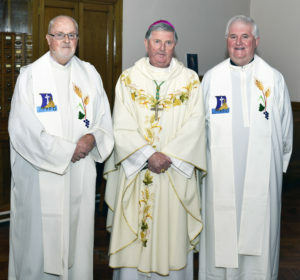 Recalling the sacrifice of the 24 Columban martyrs, who lost their lives on mission, he highlighted Fr Paddy Reilly who hailed from the Diocese of Meath, who had “a deep courage, a deep commitment and a deep faith”. 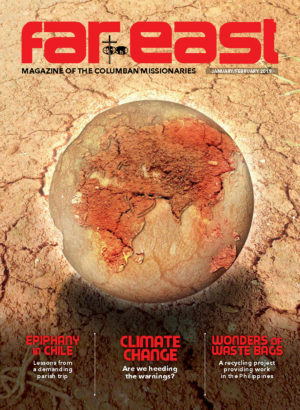 But it wasn’t just about the Columbans who died on mission, there were many members who survived difficult mission postings. Dr Smith also recalled how Bishop Galvin ended his days not in China but in Dalgan Park. 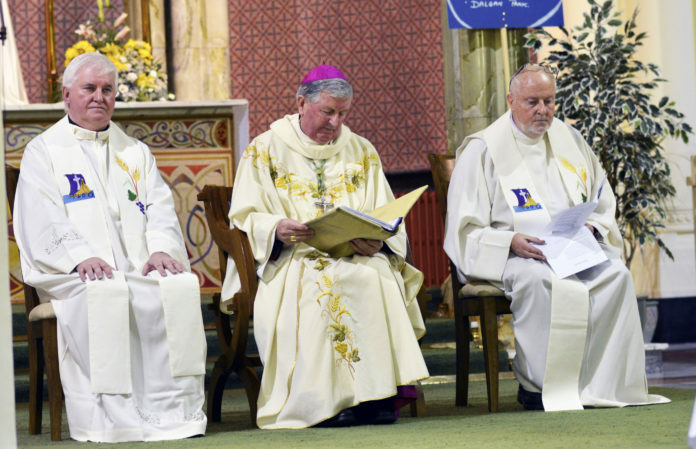 Of the Society’s patron, St Columban, the retired Bishop of Meath underlined that the Saint had brought peace and faith back to Europe, as he travelled through France, Germany, Austria, Switzerland and finally Italy, establishing monasteries and centres of learning along the way. It was St Columban who used the expression “totius Europae – of all Europe” in a letter he wrote to Pope Gregory the Great in AD600. Jean Monet and Robert Schumann, the architects of the European Union, adopted St Columban as its patron. 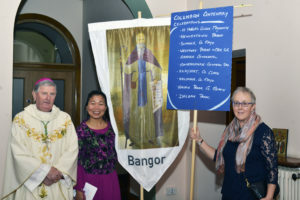 Recalling his own visit to Burma in 2009, he said “the memory was very fresh and very alive” of the Columbans among some of the communities they visited, where people had brought along photographs of the missionaries from the early years in Myitkyina and Bhamo. 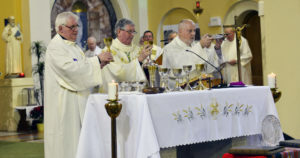 During the Mass, the new regional director, Fr Ray Husband thanked all who had joined the community in Dalgan for the feast of St Columban, which was the closing liturgy of the centenary celebration. Thanking Bishop Smith for presiding, Fr Ray recalled that he had ordained him to the priesthood 29 years ago. 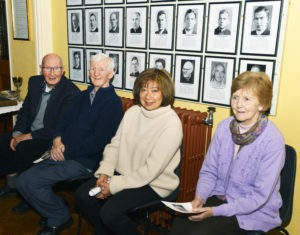 Catherine brought up the first register of the Irish Mission League dating back to 1918. 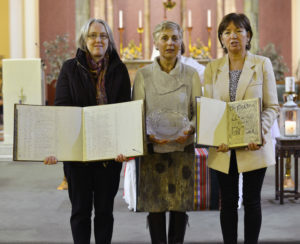 “This honours our partners in mission – the people who supported us financially and spiritually and without whose help none of the missionary endeavour would have been possible – so we honour them as we honour our Columban brothers and sisters in the Irish Mission League,” Fr Ray said. 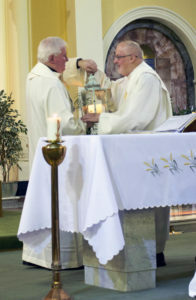 At the close of Mass, the outgoing regional director, Fr Pat Raleigh passed on the symbol of light to his successor Ray Husband. 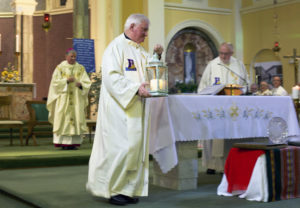 He prayed that that the light of Christ would be an integral part of all Fr Ray and the new vice regional director, Fr Gerry Neylon, as the Columbans entered their second century, and that the Columbans would continue to share the Gospel joy. 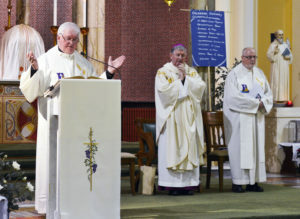 Bishop Smith thanked Fr Pat Raleigh for his “gracious administration and his outreach to people” which he said was very affirmative and supportive over the six years he was director. Dr Smith wished Fr Ray grace and blessings as he takes up the mantle.